It is often thought that maintaining a well-balanced diet with fruits, vegetables, meat, wheat, dairy and other healthy foods will provide all the nutrients required to live a healthy, happy life. In a perfect world this would be the case! But in the environment we live in today, it is essential to take supplements in order to counteract the downsides of our current environmental situation, as explained below. Taking supplements like Vital Greens when required is a safe way to get the nutrients you need, provided you follow the instructions on the label. Trace elements are often lacking in agricultural soils! Years of farming and digging up soil has depleted trace elements in the soil. Unless these trace elements are regularly replaced, soil ends up losing these nutrients. Selenium, for example, has been depleted in soils throughout the world, particularly in Australia, New Zealand and the UK. Take a look at your current diet. Is it unbalanced? Did you know that a diet full of highly refined carbs can deplete B-group vitamins in your body. As a result, you can become lethargic, irritable and even develop sleep disorders. Fast foods also contain little nutritional value, being mainly sugar, fat and salt, so a fast food diet can quickly lead to nutritional deficiencies. Think about the amount of time you cook your food and how often you burn or overcook your food. Cooking your food for too long or reheating different types of foods such as meat and vegetables decreases the amount of nutrients in the food. High temperatures destroy B, C and E vitamins. Vitamin E helps build and repair tissues throughout the body. However, freezing and defrosting foods with Vitamin E destroys most of the levels of Vitamin E in the food. Not only that, but Vitamin E foods are often made with high amounts of preservatives to maintain freshness. These preservatives can wipe out all the benefits that Vitamin E provides. Our environment poses a wide array of chemicals and toxins, whether they are floating in the air or on objects that we touch. When we eat food that has been exposed to these toxins, it can hurt your immune system. This is often unvoidable, so in order to counter these toxins in our environment, it is a good idea to take supplements that cleanse our body, like Vital Greens, which contains super greens – some of the best known cleansing sources. Taking Vital Greens also decreases acidity in the body which often comes as a result of eating foods with toxins. Stress uses up vitamins, mainly B and C vitamins. Whether it is emotional or physical stress, these vitamin levels decrease as a result. Drinking large quantities of alcohol can negatively impact the intestinal tract, liver, pancreas and even lead to several forms of malnutrition. B-group vitamins, vitamins A and C are all diminished when you drink alcohol. Not only that, but alcohol can negatively impact your metabolism and therefore impede your ability to absorb nutrients. It’s inevitable that as we age our ability to absorb vitamins and minerals decreases. Reasons for this include disease, impairment, reduction of digestive enzymes and even impaired sense of smell and taste. Vitamins and minerals that are more difficult to absorb as you age include zinc, calcium, folic acid and Vitamins C, B1 and B6. Vital Greens contains all these vitamins and minerals, and it enhances the ability to absorb these nutrients too. Growth spurts are common in the teenage years; however these spurts require a large amount of nutrients in order to assist in the spurt. Nutrient levels in the body are therefore diminished during the teenage years, especially for girls. Athletes are burning nutrients rapidly and therefore require larger amounts of food and nutrients. Because of this physical stress, B-group vitamins and Vitamin C can decrease drastically when not compensated for. Iron decreases as well, not to mention excess sweating results in mineral loss. When dieting you lose many of the vitamins and minerals gained when eating regularly. Even people who are not on diets may simply have light eating habits and therefore need to get thier recommended dose of vitamins and minerals with a health supplement, such as Vital Greens. Strange diets that make villains of entire food groups can be seriously lacking in vitamins required to live a healthy life. Vegetarian diets can lead to anemia because of low levels of iron. Also, low fat diets can be lacking in Vitamins A, D and E.
Regardless of your diet, if you have problems with digestion, it can limit the amount of nutrients absorbed. Most people have problems with digestion because they don’t chew their food enough or they eat too quickly. Since large portions of food are passing through the body without being properly digested, supplements such as Vital Greens, are needed to compensate for this loss. Consistent consumption of hot liquids such ad coffee, tea and spices can cause inflammation in your digestive lining. It can also dilute digestive fluids when consumed 20 minutes before or after eating, thereby preventing food from being properly broken down and nutrients from being absorbed. Smoking can damage the digestive tract and decreases the amount of Vitamin C in the body. People who use laxatives frequently can damage the functionality of their intestines, causing poor digestion and the inability to send nutrients to the rest of the body. Laxatives can also simply flush out nutrients from the body, such as magnesium, sodium and potassium. Although antibiotics can be helpful when fighting disease, they also kill valuable bacteria in your digestive system that can produce and help absorb B vitamins. Vital Greens contains probiotics. Unfortunately many people with allergies have to completely remove entire food groups from their diet. They have no choice. However, they can replenish the lost nutrients through supplements. So if you are allergic to lactose, for example, you may be losing essential nutrients like calcium. Vital Greens is gluten and lactose free. Illnesses and accidents can lead to depletion of essential nutrients. For example, infections require higher amounts of magnesium, zinc and B & C vitamins. Before and after surgery you will need to replenish Vitamin E, Vitamin C, zinc and other nutrients. People who are inside all day can suffer from a severe lack of Vitamin D, which predominantly comes from sunlight. People who work at night or are bedridden or for various other reasons do not get enough vitamin D, can have problems with bone strength, as Vitamin D is needed for calcium absorption. Vitamin D is needed for general well being and a sense of happiness. Vitamin D also plays a role in immunity and lowering inflammation in the body. 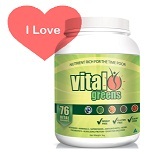 Vital Greens contains Vitamins D.
Women who are experiencing pre-menstrual symptoms can benefit from vitamin B6. B6 helps to reduce bloating, headaches and depression. An increase in need for B and C vitamins occurs when taking oral contraceptives. Since there will be a decrease in the absorption of folic acid while taking oral contraceptives, it is necessary to compensate for this loss. The body has an ability to store a large amount of vitamins such as A and E, however recent studies have shown that 30% of people have difficulty maintaining these reserves. The inability to store these vitamins can impact on your skin, eyesight and sinuses. Daily use of Vital Greens can help build reserves and prevent deficiencies. Recommended Daily Intakes for different nutrients are not always accurate for your own personal requirements. Depending on your physical demands, you may actually require more nutrients than the actual recommended intakes. As Vital Greens is in powder form, you can easily take more or less, as advised by your health care practitioner. 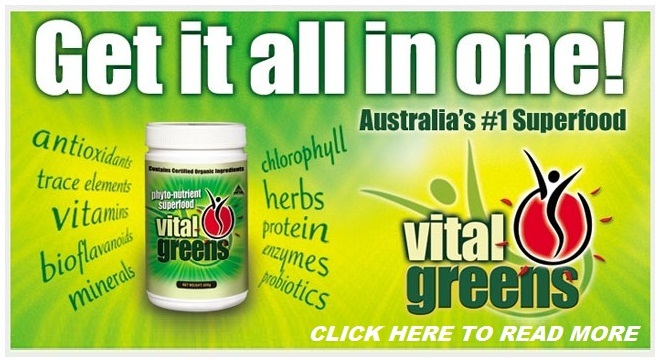 CLICK HERE TO READ MORE ABOUT VITAL GREENS!